The 15th of September is Battle of Britain day. It commemorates a turning point in the struggle for aerial supremacy in the skies over Britain fought by the RAF and German Luftwaffe during the summer and autumn of 1940. German daylight raids would eventually cease by the end of October, and Operation Sealion, the German codename for the amphibious invasion of southern England, would be cancelled. It was Nazi Germanys first significant defeat. A victory won by a handful of daring pilots from across the globe and two iconic aircraft: the Hawker Hurricane and Supermarine Spitfire. However, one aircraft would go on to capture the hearts and imagination of the nation. Since 1940, the Spitfire has become an enduring symbol of courage, fortitude, ingenuity and Britishness. My own little September love affair with the Spitfire started with the release of the documentary film Spitfire – Inspiration of a Nation, directed by David Fairhead and Ant Palmer. Narrated by Charles Dance, the film is a biography of both the aircraft and the men and women who flew it. The original music score by composer Chris Roe and mesmerising aerials photography by director John Dibbs work beautifully together. The film was the last onscreen interview given by Battle of Britain fighter pilot and author Geoffrey Wellum, DFC. The film is also the last testament of Mary Ellis, who flew 76 different types of aircraft during the war as part of the Air Transport Auxiliary (ATA). Ferrying aircraft between factories and operational squadrons, the ATA played a vital support role. During her career, Mary delivered over 400 Spitfires safely to their destinations. The film also features a sound recording of aero engineer and chief designer of the Spitfire, R.J. Mitchell, who died of cancer before his creation went into service. Spitfire is a great piece of documentary film-making, and definitely worth the purchase price. The last event to mark the centenary of the RAF’s first 100 years, the Battle of Britain Air Show was held at the IWM Duxford on the 22nd and 23rd of September, 2018. Unfortunately, the weather on the Saturday was extremely challenging with heavy, persistent rain all afternoon. Nevertheless, the event organisers, aircraft owners and pilots did an excellent job. The show told the history of the RAF from its founding at the end of World War One to the modern day. Highlights of the display included two de Havilland Vampire jets, Battle of Britain Memorial Flight (Spitfire, Hurricane and Lancaster), a 617 Squadron flypast (Tornado GR4, new F-35 Lightning II and Avro Lancaster) and the Red Arrows. The show closed with a formation of 18 Spitfires. We also got to see iconic warbirds such as the P-51D Mustang, Boeing B-17 Flying Fortress, Catalina seaplane, Westland Lysander and Soviet Yak 3. Sadly, the MiG-15 was not able to fly due to the adverse weather conditions. 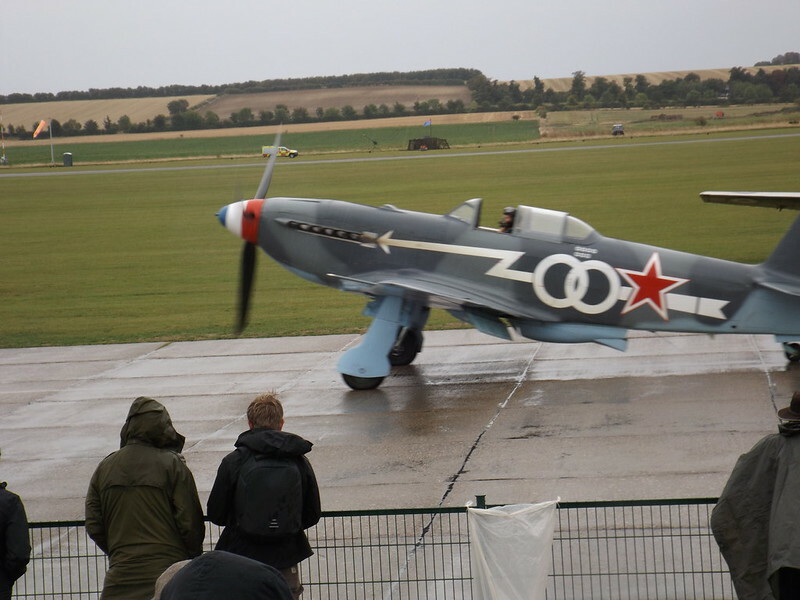 The Battle of Britain Air Show was a very impressive event, and one I would highly recommend. There’s nothing like seeing 18 Spitfires take to the sky, and listen to the combined roar of all those Merlin and Griffon engines. Finally, I finished my Spitfire September by reading John Nichol’s book Spitfire: a Very British Love Story. A former RAF pilot, John Nichol knows a thing or two about aerial combat. During the 1991 Gulf War, he was shot down, captured and tortured by Iraqi forces. His book examines the Spitfire’s origins and continued development during the war years, where the threat from new enemy aircraft demanded constant innovation. When the Spitfire was finally retired from RAF service in 1957 there had been 47 variants including the Fleet Air Arm’s Seafires. However, the book is really a collection of stories about the different role the Spitfire played in the lives of frontline pilots such as Allan Scott and Hugh ‘Cocky’ Dundas, and ATA pilots like Diana Barnato Walker. Sadly, unlike the beloved Spitfire, the veterans of the conflict do not endure. John Nichol interviewed around 40 veterans over a three-year period of research and writing his book. By the time it was published only three were still with us. Soon the “greatest generation” will be gone forever, but while Spitfires continue to fly, let us hope they will never be forgotten.